Like a lot of girls from the "thin eyebrow" generation, I am not and never have been blessed with big, beautifully shaped natural eyebrows other girls have. I would spend 20 minutes in a morning fighting with my eyebrows to make them look like they were at least from the same family, which usually ended up with me wiping them off three times or giving up completely. I had seen more and more people getting their eyebrows microbladed and I was so scared as they are a lot more permanent than simply waxing and tinting them, and I wanted to make sure I chose the right person to do them. I was also fearful of the whole process as I didn't really know how it all worked and how they healed, and most of all, I was scared of the pain! 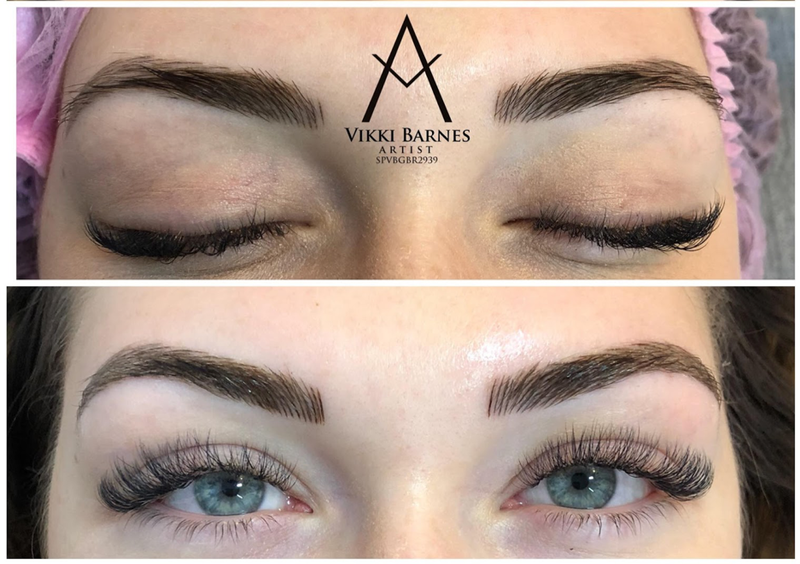 Luckily, my usual brow/lash lady Vikki started doing Microblading earlier this year, and I already trusted her with my brows so I decided to go for it, and I'm SO glad I did! 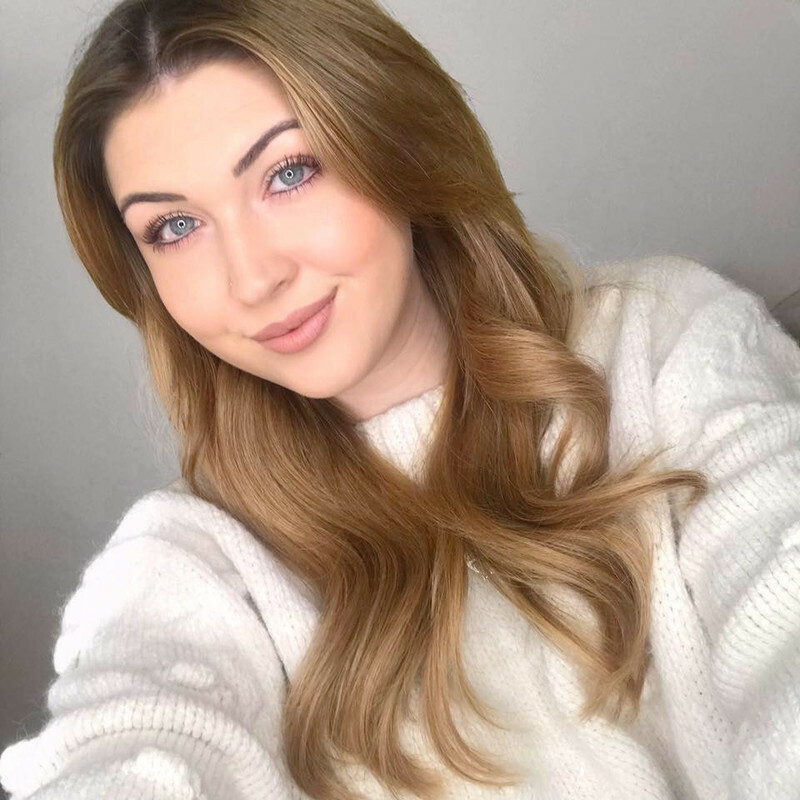 I thought I would put together a blog post all about my own experience, to help anyone who is thinking about having this procedure done! This is the before and after of my brows after my first appointment. I had very little hair on the tops of my brows so I had lots of strokes added there, as well as at the front of my brows and finally, the tails were extended to really shape my face. The first appointment is around 1 hour, but the actual Microblading only took around 20 minutes. The majority of the appointment involves measuring the brows and making sure the shape is perfect. The actual Microblading process is done with a tool which looks a bit like lots of needles all in a line, not a scalpel which I originally thought was used. The question I get asked the most and the thing I was most hesitant about was the pain. It is scratchy but it's not unbearable, I think after a while your nerve endings react more to it so I found if a bit that had already been done was gone over again, that was slightly more stingy. I had pain relief applied after the first strokes had been done and then they are re-traced after which you can barely feel. The pain relief can't be put on to start with as it changes the texture of your skin (unfortunately!). The day I had it done, my eyebrows were swollen and a little sore to touch but this soon passes. It doesn't feel too bad but if you were to move your eyebrows, you can definitely tell something has been done to them. You are given a little pot of balm to apply to them regularly for the first few days, then just morning and night after that. This keeps them hydrated and helps to reduce the amount of scabbing. When they are fresh, the colour is a lot darker than how they will be when healed as the pigment hasn't settled in yet, so don't panic if they look too dark to start! I found that within around 4-5 days mine started to really flake for a couple of days but this is just the natural healing process. In this time, they do fade and you may think some strokes have disappeared completely. After they have stopped flaking, they start to come back again and your brows will be very nearly fully healed. Again, don't panic if they seem to fade a lot as they tend to come back a little and the touch-up will sort this too. 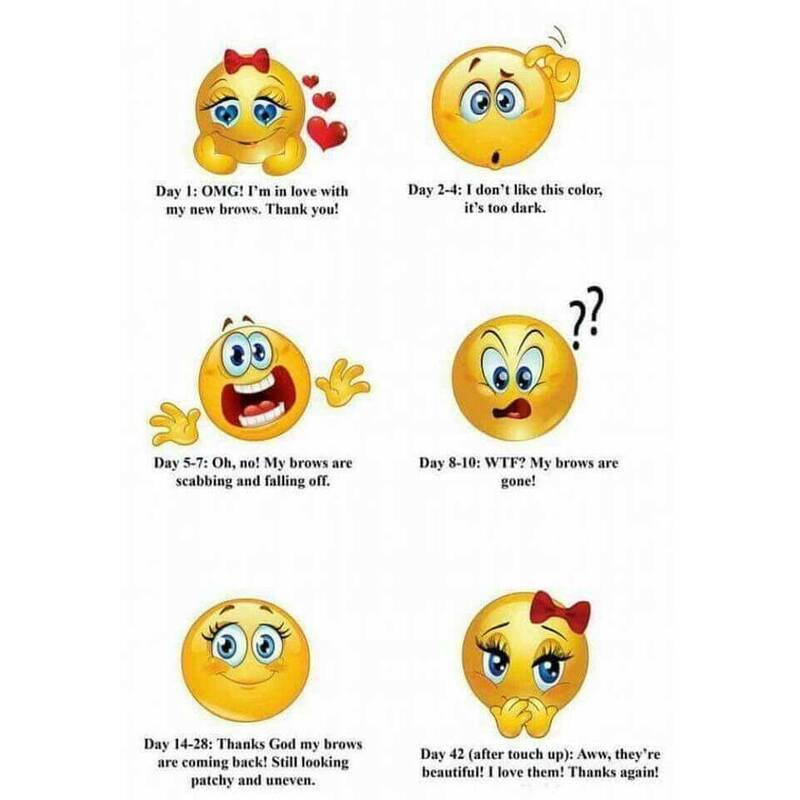 A really accurate infographic is the one above, I pretty much went through every stage! The cost of the entire procedure including healing balm and touch-up is £200 and it's worth every penny. This is the before and after of my healed brows and then after my touch-up. The touch-up appointment is perfect for altering anything and making sure they are perfect. Vikki added a few more strokes at the front as I had lost some of the very thin strokes and then went over the rest of them. This is my eyebrows before any of the procedure and then after my touch-up, and I am SO pleased. To say they have changed my life would be a little dramatic, but I am so much more confident with them and it saves me at least 20 minutes in the morning which is also amazing. The only product I use on my brows now is Glossier Boy Brow (shade Blonde), just to keep them in place and it takes 1 minute to apply! I would recommend this treatment to everyone, it is so worth it and they will last around 18 months before naturally fading and I will continue to have them touched up. 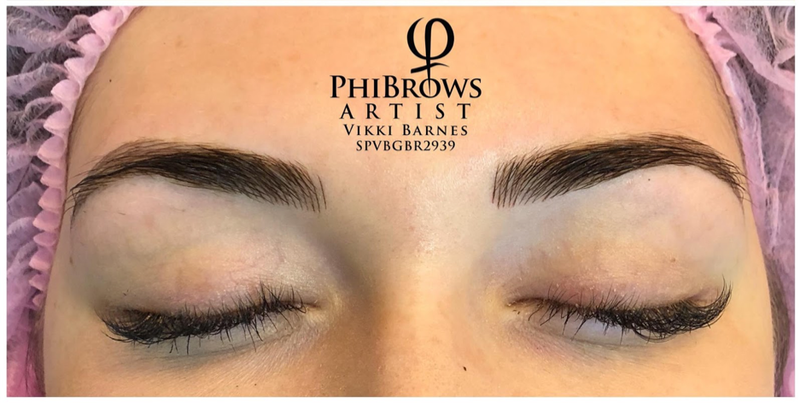 Vikki trained with Phibrows and is so talented, it's hard to believe she's only just started doing them! I hope I've covered everything! If there is anything else, please feel free to ask! Follow me for regular updates on Twitter and Instagram!